Discovering that your pet is infested with fleas could be troubling, a lot of pet owners find it really worry and usually associate flea infestation with inadequate housekeeping. Some other owners find it disturbing that these pests reside in their carpets, beds, floors and furniture. It is important you swing into action immediately after you notice a flea infestation. The first thing you have to do is to be sure whether you have a flea problem or not. Adult fleas can be seen by the human eyes, but they are very small and move around rapidly. In the early stages of infestation, you may not see adult fleas on a dog. However, you could see faeces which are commonly referred to as “flea dirt”. This is an indicator that your dog might be infested. The fleas tend to feed on animal blood which explains why their faeces may contain ingested blood. Flea dirt can easily be identified on light coloured dogs, for dark dog coloured dogs, it could be more difficult to identify. Using a flea comb on your dog could help to pick out flea dirt particles, including adult fleas on the body of your pet. Flea dirt looks a lot like ground pepper and sometime could be mistaken for normal dirt. You differentiate flea dirt from real dirt by placing the dirt on a mildly wet white tissue or toilet paper. Flea dirt when in contact with moisture will leave reddish rust like the colour on the tissue or toilet paper which shows the blood of the pet that has been taken in by the flea. Discovering fleas or flea dirt on your pet is a clear indicator that your dog has been infested or has been bitten by a flea. You should also be cautious if you notice that your dog is scratching or biting. There are dogs that suffer from flea allergies and as such get very itching when bitten by a flea or two. In such situation you might not be to see the flea or flea dirt as constant biting, scratching and licking can distort the signs that there are fleas present on your pet. There is a common notion that dogs scratch as a result of fleas present on their skin, however, this isn’t entirely true. The main cause for allergies from a flea bite is due to the saliva from the flea which is absorbed by the skin of the dog when a flea is taking in the dog’s blood. Itching could occur anywhere on the dog’s body. However, the most common parts include; the groin, the hind legs, on the skin between the ribcage and the tail. It should also be pointed out that not all dogs have an allergy to fleas, as such lack of itching isn’t an indicator to determine the absence of fleas. For dogs with thick fur coats, it is quite difficult to notice flea bites. To inspect your dog, make sure to check areas on the skin that aren’t covered with plenty furs like the armpit, and groin for feel bite indicators like raised areas of redness. Differentiating between a flea bite and mosquito bites or bites from other insects isn’t a walk in the park as most insect bites display the same symptoms. Nevertheless, mosquito bites are singular and can be found at any location on the body, usually take longer to treat and are prevalent in warm climates. The easiest way to differentiate a flea bite from a tick bite is by discovering a tick on the skin of your dog. Tick bites are a lot similar to flea bites on dogs; they typically have the same appearance and same reaction as flea and mosquito bites. Tick bites tend to develop a raised sore or a scab, whereas scabs develop on flea and mosquito bites as a result of secondary actions like scratching and biting. Once the presence of a flea infestation has been ascertained, it is essential you take serious steps to address this menace before it escalates. The first step should involve bathing your pet with the aim of removing adult fleas and flea dirt from your dog’ skin. This step does not prevent fleas from re-infesting your dog if they are fleas present in your environment. If you intend to apply shampoo and other topical flea products, always ensure to take a look at the product instructions as some products should not be applied within two days after bathing your pet. There are several natural flea remedies for dogs, in addition to home remedies for fleas on dogs that will effectively get rid of fleas on dogs. It is recommended that you consult a qualified veterinary doctor for the best flea treatment for dogs. If you have other pets like cats it also advisable you make use of treatments ideal for cats. Some flea treatment applied for dogs could be harmful to cats. To completely get rid of fleas on dogs you need to effectively treat any pet that is infested. 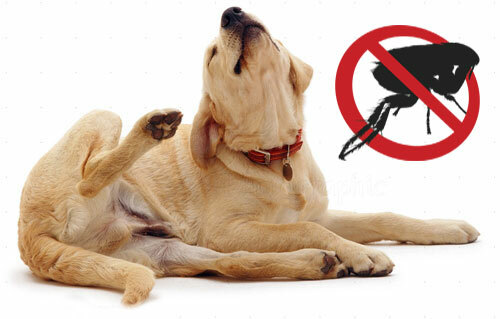 Asides treating your pet from flea infestation, home remedies to get rid of fleas on your dog should not be left out. One such home remedy involves vacuuming your home and surrounding environment regularly, either weekly or every other day. In addition to vacuuming, you should also endeavour to wash your beddings if your dog usually sleeps on your bed regularly. Engaging the service of an exterminator is also another to go if you require further help. It is important you provide the exterminator with information about all the kinds of pets in your house including birds, fish and reptiles. Treating your pets carefully in the first instance is the first step to flea control, this approach goes a long way to ensure major flea infestation issues are prevented from occurring in the first place. If for any reason your flea control measures are not effective or adequate to prevent flea infestation, it becomes imperative that you seek ways of adequately dealing with the problem. Consulting your veterinary doctor for advice and guidance on the right products to use should be the next step to take. Making use of sub-standard products could be harmful and a time-wasting venture, making use of the right product and treatment would go a long way to enhancing your chances of getting rid of fleas on your dog.